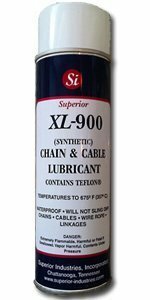 Cable Lubricant, Chain Lubricant, Aerosol Chain Lubricant, Hi Temperature Chain Lubricant â€“ Heavy Duty Chains & Cables | Superior Industries, Inc.
XL-900 is a Synthetic, Self-Cleaning Lubricant Fortified With Teflon® And Is Carried into ALL Linkages Via An Air Cured Solvent. Within moments, the solvent evaporates leaving a tough and heavy duty lubricant. XL-900 is Highly Water Resistant and WILL NOT SLING OFF. 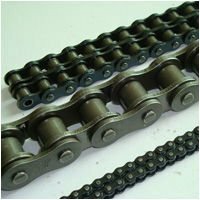 XL-900 Is Recommended For Industrial Roller Chains, Conveyor chains, Cables, Wire Rope And Provides Outstanding Performance in Motorcycle Racing Chain Applications. XL-900 is also recommended for use where lower ambient temperatures can reach -30°F (-34°C). This lubricant is considered heavy duty and recommended for use on high speed roller chains, conveyor chains, cables, wire rope and is used widely for motorcycle chain lubricating. 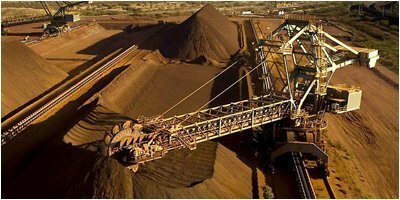 XL-900 is waterproof and has outstanding resistance to rust and corrosion. When operating at high RPM’s, the chain lubricant does not sling off and will not form any hard carbon deposits. XL-900 is a second generation of high temperature synthetic chain lubricants & cable lubricants. The aerosol chain lubricant product is packaged in a convenient to use aerosol and is fortified with Teflon®. This product operates at continuous temperatures to 650°F (357°C). It is considered waterproof and does not sling off at high speeds. XL-900 is self cleaning and each application insures parts are kept clean and free from abrasive contaminants. The air cured solvent carries the lubricant and deposits the proper amount of lubricant eliminating excessive wear. After the solvent evaporates, all parts are coated with the proper amount of lubricant. A cable lubricant and hi temperature chain lubricant, XL-900 has shown excellent results when used in ovens for lubricating chains, rollers, slow moving bearings and hangar assemblies. All moving parts are thoroughly cleaned with each application of product. 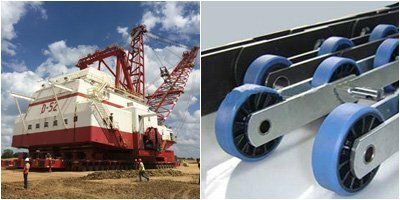 XL-900 is used on cranes, draglines, mining equipment, marine winches and lifts and is recommend where continuous exposure to salt water exists. 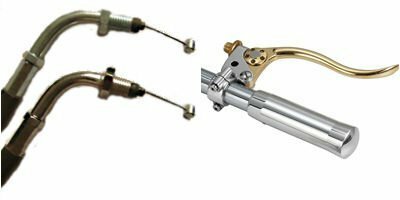 In addition, it is recommended highly for lubricating door hinges and assemblies in the automotive industry. The XL-900 aerosol chain lubricant is clear in color and has no toxic fumes. It is highly used in textile operations such as high speed chains used in spinning mills and in carpet manufacturing facilities. Cable life is extended greatly by using this synthetic cable lubricant. Wire rope must be lubricated to the inner core and XL-900 does this by deeply penetrating before the carrying solvent evaporates. When it comes to chain and cable lubricants, XL-900 should be your first choice.